Professional tile and grout cleaning keeps your floors looking fantastic for years to come. Choosing a quality tile and grout cleaning company that is trusted in the area is important. KIWI Services in Clear Lake has spent over 30 years cleaning tile and grout perfectly and we have over half a million happy customers. Choosing us is choosing the best company in Clear Lake. 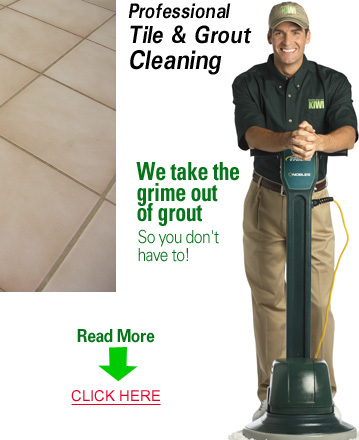 KIWI is Clear Lake’s best tile and grout cleaning company. With our professionally trained and highly skilled cleaning technicians that use state of the art tile and grout cleaning equipment it’s no wonder we have left over half a million customers happy. KIWI also offers a grout sealant that can be added on to keep your tile and grout looking great longer. KIWI always wants our customers to be 100% happy with their cleaning, which is why we offer a 30-day clean guarantee on all of our tile and grout cleaning services. If you should run into any issues, give us a call and we will come back out and offer a complimentary re-cleaning. Our representatives and technicians are happy to answer any questions you have.